1932 The first sight of antimatter came in a particle track observed in a cloud chamber at Caltech by physicist Carl Anderson in 1932. The track curved in the opposite way from the track of an electron, showing that the particle had a positive charge. But the track was too faint to come from a positively-charged proton. 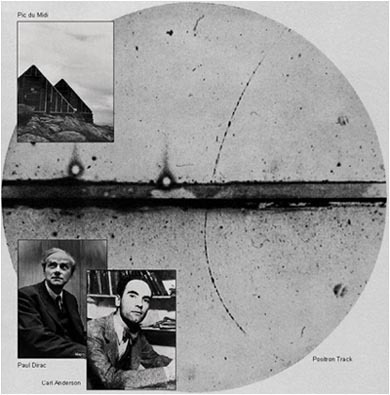 Anderson had discovered the positively charged electron, or positron, predicted by Paul Dirac in 1929. Cosmic rays continued to provide important data on high-energy particles. At an observatory on the Pic du Midi in the French Pyrennées, observers in the 1950s caught the first glimpses of a new family of “strange” particles later characterized in accelerator experiments.